Looking for a project this spring/summer? There is a great deal of potential in this house for it to be fabulous! This property offers a ton of space inside and out. Great space for everyday living or entertaining thanks to the spacious living room and family room, both with wood burning fireplaces. Both rooms have access to a deck, with beautiful scenic views. Two bedroom suites with private baths and both have access to either a deck or a patio. Spacious eat-in kitchen. The full unfinished walk-out basement offers endless possibilities. New roof and furnace in '18. Immaculate custom built 3 bedroom, 2.5 bath ranch near Lake of the Woods and golf course. Maple hardwood floors throughout the main living areas including the office/den with glass doors. Helmuth custom cabinetry, Electrolux SS appliances, large island, and walk-in pantry are just some of the highlights in the beautiful eat-in kitchen. Retreat to the spacious first-floor master suite with walk-in closet and master bath with dual vanities and walk-in tiled shower. Continue your every day living or entertaining in the full finished basement with in-floor heat, full bath plus a half bath and 2 generous sized bedrooms. 2x6 construction, tankless hot water heater, and heated garage are some other amenities you will enjoy! This is a must see home, call today to schedule your private showing. Beautiful 5 bedroom, 4 bath home in Sandy Ridge Subdivision. The staircase entry welcomes you into this home with great lighting and has many spaces for entertaining! The first floor is complete with an open living room, bedroom, dining room, family room, kitchen with stainless steel appliances, breakfast area, covered porch, and deck. The second floor features a master bedroom with private bathroom, second bath, and two other generous sized bedrooms. The daylight basement holds a 2nd kitchen, 2nd master bedroom, rec. room, laundry and storage space. There are quality updates throughout the home including dual climate control, in-floor heating, boiler, and more! Remodeled Colonial style historical home situated on 4.84 acres in Fisher School district! Enjoy the multiple views of mother nature from the wrap around porch. Spacious entry w/ original wood floors which can be found in many other rooms including the living room & all upstairs bedrooms. Quaint family room w/ newer flooring & access to the wrap around porch. Updated eat-in kitchen w/ an abundance of cabinets & a bright eating area. First-floor office w/ beamed ceiling & multiple built-ins and is connected to the 1st-floor bedroom w/ access to a full bath. 2nd floor master suite features a private bath & separate sitting area/office. Three additional bedrooms & full bath complete the upper level. The full unfinished basement offers great storage and workshop plus the laundry area. HVAC & water heater new in '14. Multiple outbuildings on this property including a 42x73 barn w/ new metal roof, a 36x160 previous poultry barn w/ concrete floor & sided corn crib w/ new metal roof. The Austin plan brought to you by Armstrong Builders is located in the newest phase of Boulder Ridge in west Champaign. Open concept floorplan featuring a spacious living room with fireplace, eat-in kitchen with island, pantry and breakfast area with access to the back patio. Roomy front entry with coat closet and drop zone with lockers and half bath located off of the 2 car garage. The second-floor master suite offers a 6x14 walk-in closet and private bath with dual vanities. Two additional bedrooms, full bath and laundry room complete the upper level. The unfinished basement offers the option to finish for additional living space, bedroom(s) and bathroom, or plenty of storage space. 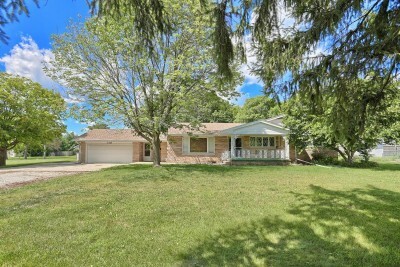 Clean and well maintained four bedroom ranch; nothing to do but move right in! The open concept living/kitchen/dining boasts gleaming hardwood floors, vaulted ceiling and an abundance of natural light. The master bedroom offers a walk-in closet and private bath. The basement features a large 4th bedroom with two walk-in closets, theater room with equipment, full bath plus plenty of storage space. Enjoy the fenced yard with entertaining deck. Easy access to Rt.150 and I-74 for your commute and only 10 minutes from C-U. Quality new construction my Armstrong Builders in the newest part of Boulder Ridge Subdivision. "The Brittany" floorplan offers a spacious living room with fireplace, open concept kitchen and dining area with a large walk-in pantry and access to the covered back porch. You will enjoy the privacy of the roomy first floor master suite with private bath and walk-in closet. Three additional bedrooms and full bath complete the upper level. The full basement is partially finished with a spacious family room plus a rough-in bath and space for an additional bedroom and storage space. Enjoy the local Subdivision park offering a playground, tennis court, room to roam, walking path and more! Popular floorplan in growing Prairie Crossing Subdivision. This 1.5 Story home features a first floor master suite with dual walk-in closets and master bath with dual vanities, linen closet, tub and separate shower. The main floor open concept living space features hardwood flooring. The spacious eat-in kitchen offers granite counter tops, island, pantry and stainless steel appliances. Laundry room with bench/locker unit off of 2 car attached garage. Upstairs is completed by 3 generous sized bedrooms and a roomy full bath. The full unfinished basement offers endless possibilities for future living space and/or storage. 9' first floor walls. The yard will be fully sodded, 1 tree planted and mulch. This location provides easy access to I-74 and Rt.150. Great piece of Heaven here on Earth. This home sits on almost 2 acres. The home offers large living spaces and generous sized bedrooms. There is a very nice sun room for enjoying the evening sunsets. This home has a newer roof, beautiful hardwood flooring and a kitchen full of nice appliances that stay with the home. There is a large shed with concrete floor on the property as well. This home and the chance to own your own piece of Heaven here on Earth is waiting for you. Please call to schedule your appointment today. Home is listed at well under assessed value. Quality new construction in popular Boulder Ridge Subdivision located in west Champaign. This 2 story home features an open floor plan with the living room adjacent to the eat-in kitchen, plus a flex room which could be a formal dining room, formal living room or office space. Four bedrooms upstairs including the master suite with private bath and walk-in closet, laundry also located on the second floor for convenience. Full unfinished basement with endless possibilities for adding more finished sq.ft. As the new owners, you will enjoy the following amenities; hardwood floors, granite countertops, stainless steel appliances, fully sodded yard plus plantings and mulch. Rave Homes has arrived in Monticello! They have been building in Central Illinois/East Central Illinois for almost 40 years and they have finally brought their exquisite product to Sage Country! "The Zelda" model located in the new Sage Meadows Subdivision is a 2-story, 4 bedroom home featuring stunning granite countertops, walk-in pantry, eat-in kitchen with island, living room w fireplace, hardwood floors and partially brick exterior. Stainless steel appliances. Unfinished basement will be ready to finish out to suit your needs if desired. Second floor master suite w walk-in closet and private bath w separate shower. Three additional bedrooms, full and bath and laundry room complete the upper level. Rave Homes is known for not only finishing the inside of the home with great detail but exterior as well. The home will include full yard sod, brick edging, tree, plantings and mulch. Home is close to Lodge Park, Kirby Medical Center, CrossfitKMC and backs up to 1 Mile Walking Paved Path. Top notch new construction by Rave Homes in growing Boulder Ridge Subdivision. Located on the west side of town with easy access to Rt.10 and Rt.150. This house is popular for the roomy floorplan; eat-in kitchen with hardwood floors, granite, island and stainless steel appliances. Vaulted ceiling in the living room plus a fireplace. You will enjoy the split bedroom floorplan and the private master suite with full bath and walk-in closet. All of this plus a full unfinished basement provides endless possibilities for more living space. Enjoy the local Subdivision park offering a playground, tennis court, room to roam, walking path and more! Fully sodded along with plantings and mulch. Move in ready 4 bedroom home with 2 1/2 baths located in the established Copper Ridge Subdivision. The open foyer welcomes you into a wonderful layout that is perfect for entertaining and features 9ft ceilings! The spacious eat-in kitchen features a center island along with stainless steel appliances. That welcomes you in to the family room with a fireplace. The large master bedroom suite features vaulted ceilings and a large walk in closet. The private en-suite master bathroom featues dual sinks,separate shower and soaking tub. The full unfinished basement boost over 1125 sq. Ft. For endless possibilities. The oversized private backyard with a cedar privacy fence welcomes you to play,garden or just relaxing. All major mechanicals have been updated 2012-New roof, 2019 new hot water heater, New 96% efficient HVAC system with a touchpad thermostat. Make this home a must see!!! Nestled at the end of a cul-de-sac in a well-established neighborhood, this completely remodeled home in move-in ready! Entertaining and every day living made easy thanks to the open floorplan offering a formal living room and dining room with vaulted ceiling, eat-in kitchen with beautiful warm cabinetry, tiled backsplash, stainless steel appliances and tile flooring. Spacious family room with ceiling fan. Second-floor master suite features multiple closets and private bath. The first-floor bedroom would also make a great office space. Enjoy the beautiful views, privacy and the large open common area maintained by the village from the enclosed porch and oversized deck. Don't let this one get away, call today to schedule your private showing! Top notch new construction by Rave Homes in growing Prairie Crossing. This house is popular for the roomy floorplan; eat-in kitchen with hardwood floors, granite, island, and stainless steel appliances. Vaulted ceiling in the living room plus a fireplace. You will enjoy the split bedroom floorplan and the private master suite with full bath and walk-in closet. All of this plus a full unfinished basement provides endless possibilities for more living space. Fully sodded along with plantings and mulch. Great new construction in growing Prairie Crossing Subdivision! This Rich Ranch with sideload garage is situated on a corner lot and features an open concept living space with hardwood flooring & vaulted ceiling, private master suite thanks to the split bedroom floorplan, 9' ceilings, spacious eat-in kitchen with granite counter tops, island and stainless steel GE appliances. Full unfinished basement with rough-in bath offers endless possibilities for future living space such as a rec/family room, 4th bedroom and still room for storage. Fully sodded yard, one tree, plantings and mulch. The home of your home of your dreams is finally here. This home offers space inside and out. The offers new kitchen with appliance that stay, new flooring, a new above ground pool and a very nice new deck surrounding it. There is a very nice four season room connected to the deck for grilling and entertaining. The lower level offers a theater projector with surround sound and a 3D projector playing on a 120" screen. The home also offers up dated windows, some sliding glass doors have been replaced, the hot water heater new in 2017. The garden shed is 3 three months old. This home offers a large amount of storage. The back yard is fenced in, but a gate provides access to Bridle Leash Park. This is a must see home. If its room you need at a great price don't miss this one. Schedule our appointment today..
New construction Ranch in popular Prairie Crossing Subdivision. This three bedroom home is situated on a corner lot and features a split bedroom floorplan and open concept living. Vaulted ceiling in living room, eat-in kitchen with hardwood floors, granite counter tops and stainless steel appliances. As the owners, you will enjoy the privacy of the master suite with walk-in closet and private bath. The full unfinished basement provides endless possibilities for future living space and/or storage. Fully sodded yard, brick edging, 1 tree, plantings and mulch. This location offers easy access to I-74 and Rt.150. Great location at Lake Iroquois. This home offers a fishing pond view with great mature trees. There are 3 extra building lots that are full of mature trees as well. This home offers an updated kitchen and all appliance stay. There are two wood burning fireplaces in this home to warm you in the winter. The hardwood floors flow nicely on the main level. This is a great place to enjoy fishing, boating, hiking or swimming. This home is a must see. Beautiful and bright three bedroom condo with open floor plan situated in a cul-de-sac. Roomy living/dining room combo with fireplace flanked by built-ins and access to the enclosed porch. Updated kitchen with beautiful white cabinetry and stainless appliances. Updated Master bath & guest bath. Large deck with pergola & ceiling fan is the perfect spot to relax and unwind from the day. Condo Fees $150 month. Move in condition. Move right in and enjoy this new construction zero-lot in Sawgrass Subdivision. This 3 bedroom, 2.5 bathroom home features a spacious custom kitchen with island, granite counter tops, and walk-in pantry. The dining room and vaulted great room with hardwood & fireplace would provide great space for entertaining. Master Suite with master bath & walk-in closet. Zero grade entry from the 2-car garage, high-efficiency windows & doors, and trane high-efficiency HVAC. Much more in this must see home, call today! Move right in and enjoy this new construction zero-lot in Sawgrass Subdivision. This 3 bedroom two and a half bathroom open floor plan home features a spacious kitchen with island, granite counter tops, stainless steel appliances and walk in pantry. The dining room and vaulted ceiling great room features hardwood floors and a gas burning fireplace provides great space for entertaining! The master suite features a full bathroom with dual vanities and a walk in closet. Other great features of home is zero grade entry from the 2 car garage, high-efficiency windows & doors,high-efficiency Trane HVAC and much more! Beautiful 2-story home features an open floorplan, great for everyday living and/or entertaining. You will enjoy the spacious family room with new hardwood floors & a fireplace. The adjoining updated kitchen offers a large, working island, white cabinetry, quartz countertops, stainless steel appliances, and new hardwood floors as well. New hardwood flooring continues in the formal dining room. Retreat to the second-floor master suite with walk-in closet and private bath with dual vanities, tub, and separate shower. The screen porch will be the perfect place to relax or entertain and overlooks the private fenced in backyard. The full unfinished basement offers endless possibilities for future expansion or storage and features an egress window and rough-in bath. Oversized 2 car garage offers additional storage or workshop space. This home is a must see, call today! From the moment you walk in you will feel right at home in this spacious three bedroom ranch. The expansive living room boasts vaulted ceilings, skylights, and a beautiful brick fireplace flanked by built-ins. The kitchen includes an abundance of cabinets and all major appliances. The large master suite amenities include a large walk-in closet and private bath with a jacuzzi tub, separate shower and separate dual vanities. Relax and enjoy the large sunroom overlooking the expansive deck and fenced in backyard. The oversized 3 car attached garage is nicely finished and offers enough space for a storage and play. Newer home in a very well established neighborhood. This home was built to fit the surrounding homes. The home has just been professionally painted and all woodwork re-caulked. The home offers a large master bedroom with an extra sitting room, exercise room or office. The large deck off the back was just refinished and ready for entertaining and overlooks the fenced in backyard that is professionally landscaped. The front and side yards have received professional landscaping as well. The large covered front porch is waiting for your decorating touch. This home is just minutes from all the happenings in downtown Champaign and close to park. This home will not last long so schedule your showing today. All stone three bedroom ranch situated at the end of a dead-end road on .47 acres with mature trees. A total of 2488 sqft of living space which includes the finished basement offering a family room with fireplace, bar area, laundry room and flex room with closets. The main floor features a spacious and bright living room with wood burning fireplace, formal dining room and eat-in kitchen with an abundance of cabinets. Next summer, enjoy the fenced in in-ground pool with a large patio area with friends and family. New roof in '16, new central air, some windows have been replaced, updated bathroom. Don't miss out on this opportunity to own this well-built home in an established neighborhood.